In the wake of an investigation conducted by the Griffin-Spalding County School System that officials say revealed grade changing at Kennedy Road Middle School, administrators are awaiting test results prior to making parental notification. Superintendent Curtis Jones said at this time, he is uncertain how many students may have been affected by what he has described as “an unwritten policy” of KRMS Principal Dr. Brenda Ford that required teachers to make contact with the parents of failing students on three separate occasions. If the threeparental contacts could not be verified by school administrators, the teachers were required to change the students’ failing grades to a 73, or the lowest C.
“I do not believe parents have been identified specifically because we don’t know whose been affected,” he said. Jones explained that district administrators are awaiting results of the Criterion-Referenced Competency Test (CRCT), which they believe may assist them in identifying which students’ grades were changed. Although he said some preliminary scores have been reported, the final analysis of the complete CRCT results will not take place until summer. Jones said that any student who did not pass the CRCT will have an opportunity to retake the test. This, he said, not only applies to Griffin-Spalding County students, but rather is an opportunity offered by the state. Ford, who on April 6 received a letter of reprimand from Jones and has now been referred to the Professional Standards Commission for possible further investigation, counters the grade changing accusations with assertions that KRMS’s past and ongoing academic success – as well as that of A.Z. Kelsey (AZK), where she served as principal prior to Kennedy Road – is evidence that no wrongdoing took place. She also cited February 2010 investigations conducted by both the district and the Governor’s Office of Student Achievement that examined some local schools’ high number of wrong-to-right erasures on the CRCT. “My schools were never ones that were in question,” Ford said. He then said that grades are an indicator of success on the CRCT. “I’m not sure – a student whose grade got changed from an F to a C and passed the CRCT – the changed grade may better reflect what the child knows. It may be an indicator they were proficient in the subject matter,” Jones said. This indicates the importance of a cross analysis of CRCT scores and student grades, he said. System administrators say they are uncertain how long grade changing has been taking place at KRMS, which means some students affected may already be in high school. He explained that due to the different type of testing high school students undertake – end of course tests as opposed to the CRCT – the cross analysis becomes more limited. “That’s not our priority right now,” he said. Well, it seems to have come full circle! Dr. Ford will be retiring on 7/31/12. To the teachers at KRMS…become proud of your school once again and go forth with a positive work ethic and attitude. The students still need you! Why are some teaching positions not posted by the school system? Several friends wanted to apply for the opening in the Gifted Program. The position was never posted. Also, why do teachers within the system receive a position when they have minimal qualifications but other applicants with better qualifications and skills can help the STUDENTS well instead of doing the work that a PRINCIPAL cannot or will not do? I agree. There are a lot qualified teachers who can’t get a job because the positions are not posted. But will all this scrutiny really change anything? It is highly doubtful. According to people who work in many of the schools, the principals, administration , school board, and human resources have assumed that they are all powerful. By Georgia law, they are not all powerful. I hate to think we will be another Clayton County but we are heading there. The first sign is extreme arrogance on the part of people in charge. The school board needs to wake up and realize that they have some principals that are considered very abusive. Everyone in the education field has jobs because they are serving the CHILDREN of our county. Our county has many attractions to businesses but the schools are one of the main reasons we do not have large companies move here. Alex you took the words right out of my mouth. If nothing happens to that principal the superintendent is sending the message that this is okay to do. Also if nothing is done, none of those teachers are going to trust him ever again. They would have put their necks on the line for nothing. If I were them I would go to another school. Grades are changed for other content areas, not just in the area of science. However, teachers can manipulate grades various ways. Some change the grade by exempting grades in Infinite Campus to increase their cumulative average. Others actually change individual classwork, homework, test/quiz, or final exam grades to increase the students’ cumulative average to a 73. 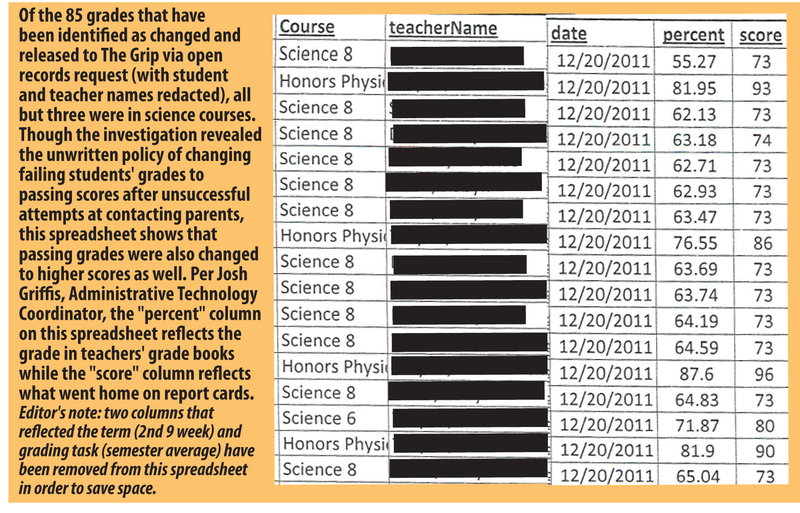 Then there are some teachers, like the ones shown in the article, who just override the grade. This means that the student receives a 73 at the 9-week interim, but once the next 9-week period begins, the students are actually earning the average that is reflected on assessments given in class. Those averages are true reflections of the students’ progress. The problem is that this method is more evident than the other methods. The 85 grades that were reported came from teachers that chose to override grades instead of manipulate in other ways.